Day 1 @Envision NOLA 2016 has been enthralling for our team at booth# 851. On Day 1, as promised, the focus was clearly on highlighting the importance of technology across businesses and driving value for business leaders. The keynote address by Microsoft CEO Satya Nadella was very informative, inspiring and an indication of the amazing things we can start expecting from brands moving forward. The major focus of the keynote was around the role of technology in business for digital transformation. The Microsoft CEO encourages businesses to ask and answer two key questions, as part of their digital transformation. How is your business being digitally transformed? How is your business model being digitally transformed? In his keynote, he further emphasizes on how this will help businesses become the digital company that will define their competitiveness and their ability to change the landscape of the industry they operate in. The rest of the keynote further expand on the four elements mentioned above. Now these four points reinforce what we at i95Dev have believed all along and worked hard towards. Our vision, our solutions, and our products help businesses become the digital companies that Mr. Satya Nadella was referring to. Engage your Customers – i95Dev integration solutions provide brands a framework they can leverage to get a 360-degree view of their customers, better engage them across channels, and provide consistent user experience – in other words drive the omni-channel experience. Empower your Employees – i95Dev integration solutions give employees access to data that was previously not available or was too cumbersome to access for informed decision-making and action. Improve your Products – The new found efficiency discovered because of i95Dev integration solutions will help brands focus on what really matters to their business – their products and customers. Brands can now focus more time and money innovating their products and improving customer experience. i95Dev’s offering itself has evolved from Connector to Integrated eCommerce to Hosted Instant eCommerce Solutions. 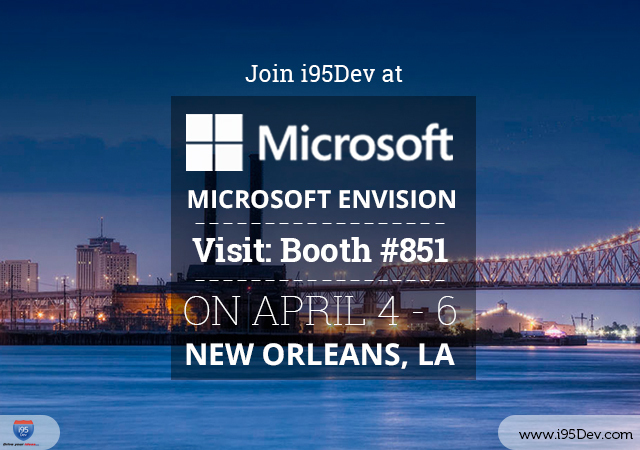 If you would like to understand how i95Dev can help you digitally transform your business come meet us at booth 851 @ Microsoft Envision NOLA.